"I love this place. It's 4-star!" When Patrick came to Vienna, he was unable to complete his daily tasks, but as his health and mobility improved under the care of our therapists, he was able to do all of his personal care. "The staff is very understanding, and I feel wanted and well-liked here. I enjoy the activities, the rehab — and the food is really good." He gave Vienna the highest compliment of all: "It feels like home." My name is Jim, and I’m a resident here at Vienna. I lost my hearing in a series of operations, so I'm not much on conversation. Instead, I've learned to watch. It's been rewarding. I've seen so many acts of kindness shown by the staff. Smiles, soft words, pats on the shoulders, there's a sense of connection, they all make a difference. I doubt that I could do the work of the nurses, daily caring for us in all our limitations, but I'm sure glad they do. I'm a bit closer to the kitchen, the laundry, the cleaning staff. Theses are jobs I've held from time to time in my life, and I remember them. I've been here for a while, yet I still wonder at how smooth the day goes. There's a comfort in routines. I know what to expect. Even so, there's the surprise of visitors, of activities where I can be a part. I have a much fuller life that I could have imagined. Following my last surgery, I kept having nightmares of waking up in a deserted hospital. Several times, I had to call the nurse to prove to myself that I wasn't alone. I haven't been troubled by such dreams since coming here. I feel connected. If I can't be at my home, I'm grateful to be at Vienna. “My husband, Don, had a stroke seven years ago. He recently fell using his walker and broke four ribs. Don was transferred from the hospital to Vienna where he spent six weeks. I’d visit every day, with our dog — morning, noon and night. I was impressed with the level of care I saw, not only for my husband, but for everyone. The nurses and aids offered special care and kindness to all of the residents. 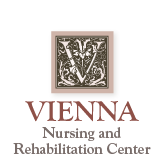 At Thanksgiving and Christmas, Vienna had nice meals and celebrations.